Have you girls heard of the Taiwan popular 3D Lifting Mask? I have been using 3D Lifting Mask from Taiwan for 2 years, I got to know about it from my Taiwan trip 2 years back. It was highly recommended by Taiwanese and their variety show 女人我最大! Sexylook is one of the popular brand of 3D Lifting Mask in Taiwan where you can find it in every pharmacies there. I’m so elated that Secretive.sg actually brought in Sexylook to Singapore!! It will be so much convenient to get Sexylook 3D Lifting Mask here in Singapore! Let me show you the steps of using the 3D Lifting Mask! 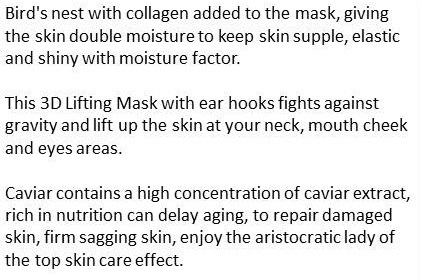 I’m going to try out the Birdnest + Caviar Rejuvenating Duo Lifting Mask. Step 1: Fit the mask on to your face. Step 3: Pull the hook at the chin up to your ear for both sides. And leave it for 15-20 minutes. Tips: You can massage your face while waiting for your mask between 15-20 minutes to maximize the absorption. The 3D Lifting Mask not just letting us to have beautiful & healthy skin, its also helps us to fight against the gravity and firm up our chin and neck areas! 3D Lifting Mask is now available at Secretive.sg & Watson outlets! !